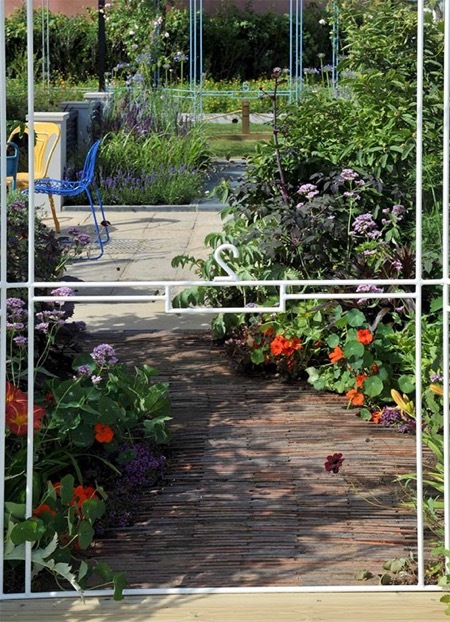 Emanuela Alladio and Jon Sims of Alladio Sims Garden Landscape Design look at the importance of applying the basic rules of geometry to the composition of a garden space. A recent trip to Great Dixter a few weeks ago confirmed that winter really is the perfect time to look at the hidden geometry of a garden, when vegetation takes a step back and allows the existing voids to create inner harmony for the new season ahead. Despite a general sense of decay and emptiness in the garden, this time of the year is not one for relaxing and letting things happen, as it actually coincides with the start of the new horticultural year. If everything going on above ground may look as if plants are shrivelling and wanting to disappear ­– and many do, indeed, go on a long sleep or dormancy period to regain their energy before spring arrives – below the ground it’s a completely different story; plants are getting stronger and everyone working around gardens is or should be planning ahead and working frantically before the first of the frosts arrive: moving plants to create fuller, more pleasing displays, dividing and repotting, ordering bulbs and planting new shrubs and trees. This is by far the best time to look at the geometry behind borders, before the fluffy growth of new vegetation obscures and weakens it: it’s the time to take stock and examine lines and proportions carefully. After all, a garden can only feel right if its geometry is right. This was the overall message from the latest Society of Garden Designers Autumn Conference. That said, how do we know if the geometry is right? At the conference there was a general sense of ‘if it feels right, it’s right – you will instinctively know if a path is in the wrong place or not, if it’s too wide or too narrow’. Yet looking at some of the slides during the conference, I started to disagree with this approach and decided that in order to produce a pleasing geometry in a garden one might benefit from applying the basic rules of geometry to the overall composition – an example would be the Fibonacci sequence and the Golden Ratio allowing us to create pleasing proportions – and only once these are set are we allowed to disrupt the rules and balance by introducing a few unexpected and exciting ‘deviations’. To base our approach on geometry, following the principles that Fibonacci explained a few hundred years ago, we can be sure that we are mirroring the perfection found in nature – that of a fern unfurling, the curve of a shell, the structure of an artichoke – these are all perfect renditions of the Fibonacci curve and serve as a reminder that nature is based on its own very specific inner harmony. This is the perfect time to take stock of your garden, so go out and take a good look at those hidden lines and proportions, and make a note of any gaps that seem too big, or paths too straight or narrow, but above all don’t forget to enjoy the subtle beauty that a garden has to offer even at this time of the year. Shrubs and small trees are perfect to create the middle ‘body’ in a garden, introducing interest at eye level. Image courtesy of Alladio Sims Garden and Landscape Design Ltd, residential North London garden, 2018. Emanuela of Alladio Sims Garden Landscape Design looks at the importance of planning a structure for a garden and not to slavishly follow the latest trends. In recent years the naturalistic planting movement has moved the focus from trees and shrubs to perennials, leaving them to bask in the glory instead, with most of us seeking the fleeting and ephemeral pleasures of their short-lived flowers whilst following the latest garden trends. Yet it is precisely at this time of year that a garden deprived of its backbone of shrubs and trees will invariably disappoint by not being able to hold its own and provide the essential structure and colour changing boost needed during the drabbest of autumn and winter days. That’s exactly why when designing a garden one really has to focus on the all-important structural layer provided by the larger plants, so that come autumn and winter the garden will still have the all important backbone much needed to continue being attractive, even in the winter months. A few images from a garden we recently created in north London really illustrate this idea. To start with there was only a stepping stone path, winding its way in the middle of a pretty empty space. Then came some large boulders to guide through the path. Next arrived some very large yew cushions, greening the path and softening the look. All of a sudden the garden started to have its own identity, and a strong backbone made of a happy mix of hard materials and evergreens providing softer but permanent shapes. As the project went on, more and more layers were added, some looser evergreen shrubs, some small deciduous trees, to create that much needed ‘middle layer’ even in the winter months when their branches are bare, so that when you walk through you feel the garden has a presence vertically and it’s not just made of dead or naked shapes on the ground. At this time of year, the golden heads of grasses and autumn flowering shrubs add a bit of movement and a hit of colour, and catch the soft light beautifully. Their relaxed presence that mixes soft buttery tones and slender stems adds movement and transparency to the overall scheme, catching the first drops of dew and securing a surprisingly long lived appearance in the winter garden. Pennisetums and Miscanthus are invaluable specimen to introduce autumn drama, dotted around the garden and repeated at regular intervals to guide the eye around the space, lacing together the whole composition in a pleasing way. And finally to the most ephemeral of all layers – a good measure of cheerful bulbs for much needed spring interest and an abundance of flowering perennials that will delight the senses from spring till late summer. Overall autumn, being so subdued, can be a very demanding time of the year for a garden, one that can only truly be mastered if the balance of shapes, foliage textures and colours is right. Shrubs and trees are invaluable elements in this composition and they can really transform a garden in autumn, and make this season sing with drama. September is harvest time, when we finally reap the rewards of home-grown fruit and vegetables, says Emanuela Sims of Alladio Sims Garden Landscape Design. Today so many of us want to grow edibles at home, but often space and time constraints work against us. Indeed, growing edibles takes a lot of time and effort, but there are ways of integrating a mini vegetable garden in our garden space to create a visually pleasing and tasty display. 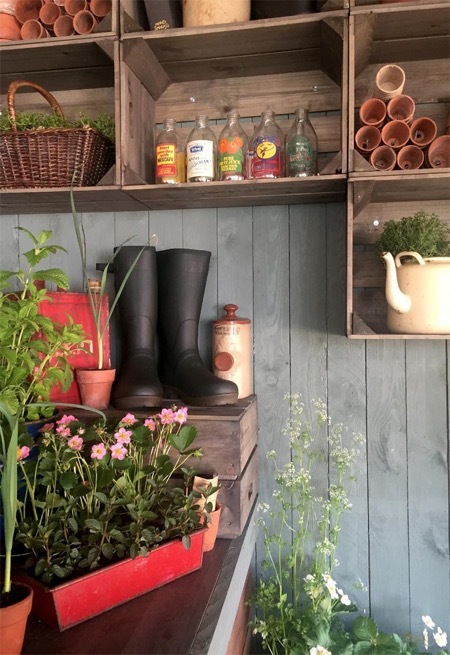 Making the best of the decorative qualities of fruit and veg growing is indeed the main challenge for a garden designer wanting to create fabulous outdoor spaces. Seen closely, productive plants can indeed be highly decorative and magically transform the aesthetics of a garden – crinkled cabbage leaves add texture to borders, juicy lettuce leaves can be very lush and multicoloured, strawberries, cherry tomatoes and fresh herbs make for wonderful hanging baskets, and who can resist the temptation to snap a fruit or two every time you brush past them? Whether you choose to dot edibles within the borders to fill in those unsightly empty gaps and create interesting combinations, or to cluster them in containers or a series of raised beds that make maintenance less taxing, the possibilities are endless and so is the fun to be had. 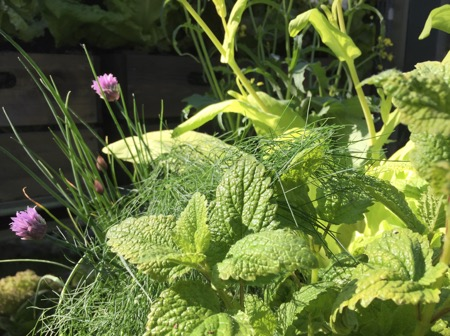 This year, for the RHS Chelsea Flower Show, we were asked to produce a series of edibles’ displays to demonstrate how pretty herbs and vegetables can be in a garden if used in a creative way. We had lots of positive feedback from visitors who were amazed at how pretty the combinations looked and even more so to discover how easy it was to recreate them at home. It was a fun experience and we came up with a series of really stunning displays that make the best of vintage upcycled props to convert them into useful edibles’ containers. Much of the fun was devising clever ways to reuse some of these discarded objects – and so old pans got a second chance to live as deep planters, old baths became mini allotments, coffee makers were reused as herb pots, shallot chicken feeding trays became pretty seed trays, wicker baskets were lined with stapled plastic bags and turned into French chic planters, milk churns became very useful courgette and pumpkin pots and wooden vegetable cases were lined and filled with cut and come again multi-coloured lettuces. If you are a foodie this is the sort of gardening that offers a chance to show off and be as adventurous as you like, experimenting with new and exciting varieties to make dishes really stand out. Just pick up some interesting seed varieties and start sowing straight away. The rest is just lots of fun, and for those who relish the challenge of giving a second breath of life to some of the discarded items in a garage or shed, then cluster a group together, staple some hessian around the containers you like the least and you will have created a stunning display that is easy to look after and water and that won’t cost the earth. Looking ahead to next year, why limit your horizons? 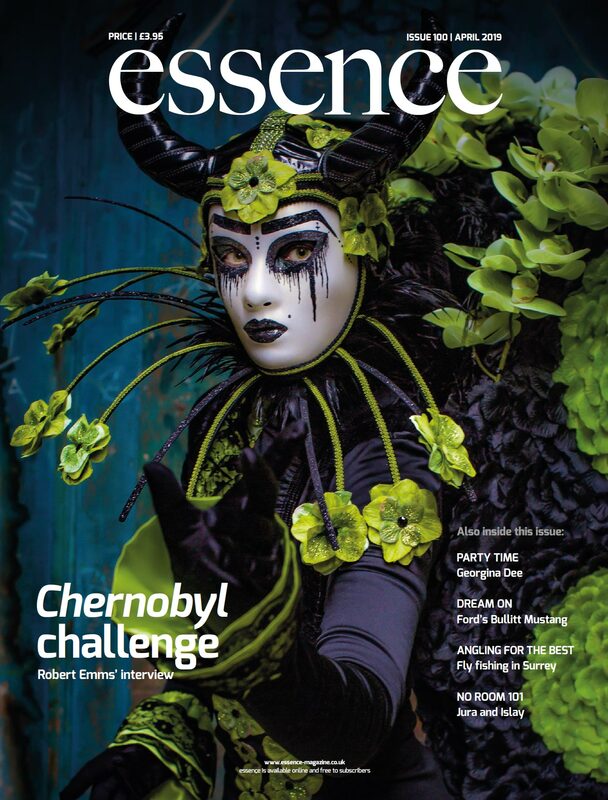 Try venturing out into the world of edible ornamentals, there is so much enjoyment to be had! 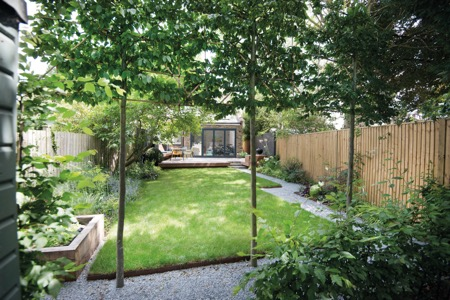 Emanuela of Alladio Sims Garden Landscape Design Limited lets us into her world and explains the reasons behind what she and her business partner Jon offer in their garden design and project management company. Q Emanuela, how did you get in to garden design and what services do you offer at Alladio Sims? A Like many others in this business I got to garden design as a second career. Previously I had worked as a linguist and conference interpreter. 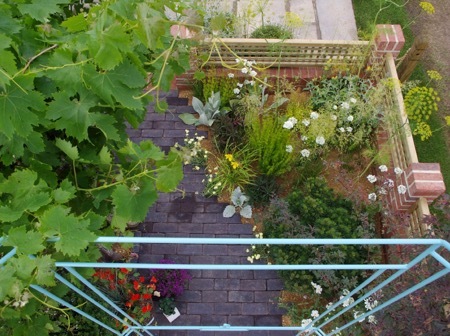 I studied at the London College of Garden Design where I met my business partner, Jon Sims. In 2015, following a successful collaboration on ‘The Secret Garden Party’, a main show garden created for the RHS Hampton Court Palace Flower Show, Jon and I decided to set up a company together to offer a more comprehensive approach to our work, and to make the most of our different skills sets. Our practice offers a design and project management service to deliver our clients beautiful outdoor living spaces from initial consultation through to completed gardens. We work with professional landscapers and nurseries and are driven by a passion for excellence and meticulous attention to detail. Q What should homeowners consider when re-designing a garden? A The first thing to consider is that house and garden should feel like they belong to each other and the best way to achieve this is to plan the garden design together with the house or the extension. This will not only allow for economies of scale, but also for a better and more uniform ‘feel’. Not to mention disruptions to the work already done when the garden is being built. If no changes are made to the house, then the best time to work on a garden is during its dormant season – autumn through to early spring – and the starting point should always be a clear brief and comprehensive garden survey. Q How can homeowners add a ‘wow’ factor to a garden? A There are lots of ways in which this can be achieved: introducing a path with a sculpture at the end to draw the eye, creating a focal point by uplighting a multi-stemmed tree, a bespoke bench to use as a lounger and/or for entertaining or a feature wall or screen to act as a ‘room divider’ giving the garden secret spaces. Q What changes can be made to a front garden to add curb appeal? A A front garden forms the first impression as we approach a house, therefore, it should always look smart and clutter free (think about where bins will be stored and how to screen them or minimise their presence). Another important point is off-street parking and ways in which a drive can be integrated into the garden when not used as a parking space. And, finally, one could choose a style that complements the house period, or one to contrast it, to create an immediate wow factor and add curb appeal. Q What quick updates instantly lift a garden? A Edging is a priority – any border or lawn looks a million times better when the edges are sharp. Q Are there any shrubs, plants or flowers which are your personal favourites and why? A Osmanthus delavayi is my favourite shrub as it’s such a hard working plant – evergreen and easily clipped and shaped: it produces little but highly fragrant flowers in spring. Its glossy leaves light up darker corners and it is useful against fences and walls to soften boundaries too. Hackonechloa macra is my favourite grass; it is well behaved, softly arching and perfect to light up a difficult dry shade spot next to hostas or aquilegias. Peony Krinkled White is my favourite flower – graceful and delicate pure white with a bright yellow centre, it doesn’t last for long, but it’s worth the wait every year! Q Can you give us your top three insider garden design tips? A Have a clear list of your objectives and allocate a realistic budget to achieve them, consider the key views out and try and draw the eye with a path or via an archway and limit your materials and plant palette – simplicity and repetition will bring all the key elements together beautifully. Q Finally, what’s hot in gardens for 2018? A There are so many hot trends! 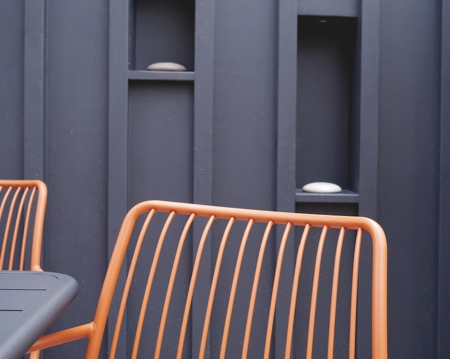 This year the emphasis seems to be back to bold colours and natural materials to create a strong story between indoor and outdoor spaces. The attraction of bees and pollinating insects is still going strong and native ‘wild’ plants and single flowers are in high demand in gardens both large and small. Emanuela of Alladio Sims Garden Landscape Design offers advice on how we can make our gardens resistant to hot summers. The weather is hotting up and thirsty plants are showing the first signs of strain. Shrivelling leaves, droopy flower heads, browning leaves, stumpy growth… All clear signs plants are suffering and not coping well with summer dry weather. What to do? Watering is a costly resource, to the planet and us, but there are ways around it, to avoid irrigation. 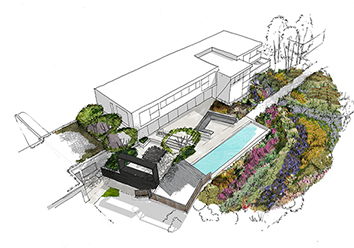 If designing a new garden, why not make it drought tolerant? This month we consider five design solutions that really can make a huge difference. Gravel gardens – they are easy to install, low maintenance, generally low cost, environmentally friendly and look good all year round. Gravel is permeable and therefore acts as mulch keeping the soil cool and moist underneath so plants are super happy. Gravel offers an instant, perfect backdrop to plants making them ‘pop’ and look good. It’s one of the most versatile materials, available in many shades, so it can be matched to other hard surfaces in the garden and beyond. For a more classic look, choose lighter gravel that blends well with bricks and lighter stones; for a contemporary take, choose grey gravel that looks fabulous against wood, black or brown. Celebrate shade – shade creates a micro climate within the garden, bringing the temperature down instantly, which in turn means plants won’t bake in the afternoon heat, even the ones with larger, greener leaves. So plant a tree or a series of hedges to create some shade in the garden and carpet underneath with shade and drought tolerant plants that will keep the scheme lush and fresh, even in the hotter months. Plant more grasses – they look good in winter with their golden silhouettes and moving flower heads and they thrive in the hottest of summers, glowing in the evening sun and softening the transition between perennials. Often native to dry sunny prairies, they are perfect for dry spells and don’t require extra watering. Create drifts of colour through mass planting of single varieties – tight mass planting of single varieties of drought tolerant plants can create a painterly swathe of colour in the garden that looks great in summer months and minimises water requirement in hotter months. The key to this planting style is as always good soil preparation, so don’t forget to incorporate lots of compost and to mulch with a thick layer of gravel or composted bark so that plants become established well before the heat kicks off. Choose silver foliage plants – silver and soft furry leaved plants cope very well with drought, reflecting the light and heat away from them to keep cool and very upright, even in the hottest of summer afternoons. The amazing tall candelabra silhouette of verbascum bombyciferum reminds us of wild Mediterranean coastal paths, the silvery foliage of olive trees, teucriums and lavenders is further proof that this is the choice colour to survive the driest of summers. Hopefully these five steps have demonstrated how easy it is to create a wonderful, drought-free garden that will embrace the summer weather, however dry or wet this may be. Emanuela Alladio of Alladio Sims Garden Landscape Design Limited asks are children and gardens incompatible? Does a family garden mean a desolate lawn, an ugly trampoline and the paraphernalia of plastic climbing frames? After all, beautiful and perfect flower borders and hordes of frenetic kids cannot peacefully coexist in the same sentence. Maybe they can. Let’s see how. When we meet a new ‘family’ as a client for the first time we are confronted with a similar list of wishes. Our task is to go back to the office and devise a solution that accommodates most, if not all, of them. It is always a very interesting challenge, and one that we relish, despite the practical restraints that each garden and site provides. Time and time again families wish to have somewhere for the kids to kick a ball (and maybe, why not, a lovely striped lawn to tend at the weekend? ); somewhere for the dreaded, but oh so useful, trampoline to sit (this must at all times be screened from view from the house of course); somewhere for vegetables to thrive happily and abundantly (after all, kids love vegetables – or don’t they? – and a vegetable patch must surely spark a new passion for them…); somewhere for pretty flowers to grow (particularly the kind that one would use to create beautiful flower arrangements); and, of course, somewhere for the kids to hide, play and discover. Solving these challenges can seem almost impossible at times, but to come up with ideas that will undoubtedly make even the most indifferent child want to explore the garden and go outside is so fulfilling and exciting that we inevitably end up developing a certain fondness towards these gardens. To help solve any similar dilemmas confronting readers, we wish to share some of the solutions that underpin the majority of the decisions we make whenever we are asked to create a family wonder in a new garden. Starting with the lawn, as this is a must item in most family gardens, when the garden is really shady or if it will be used to play ball games for the majority of the time, then one might want to consider the option of using artificial grass as there are so many different choices available nowadays and most of them are very ‘realistic’ and long lasting. Moving down the list to the love/hate item that is a trampoline, if one cannot be avoided, why not consider sinking it below the ground? Be careful to leave enough space for landing around it though, approximately a two metre radius will do. Or just hide a standard trampoline behind a low hedge, a useful solution that will create a sense of wonder in the garden and make the kids happy to be hidden from parents’ view – for a short while at least. Any good family garden should feature carefully chosen plants, including those that thrive in neglect and withstand impacts – ornamental grasses first and foremost because they are built to allow movement and therefore are much more flexible and understanding, even when hit by a football or two. We couldn’t live without the evergreen soft and fluffy Nassella tenuissima or its very tough and understanding cousin Anemanthele lessoniana, a grass that tolerates practically every condition and lots of abuse. One must also not forget to include plants that actively involve kids – vegetables and fruits, but also a variety of bulbs – these are all very important in a family garden which should be the perfect place to build lasting memories and positive experiences with children. What better way to start than by planting some bulbs together, or picking some fruit to make a jelly or an apple crumble after a generous September harvest? Of course, a small vegetable garden would be the perfect easy first step, especially if kept to a manageable size, such as a small raised bed, and maybe a few fruit trees and colourful pots with spring bulbs could be enough to start with. Whatever the challenge gardens pose, there are so many different solutions and ways to respond to them, just think creatively. 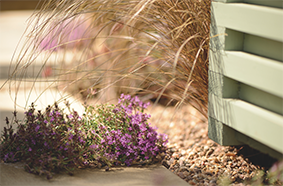 Emanuela of Alladio Sims Garden Design Limited shares her top ten tips for creating a wonderful garden worthy of an RHS show in our homes. 1 Frame the view: most gardens are viewed from the house and in order to work they need to relate back to it; the key details of the architecture of the house need to be repeated within the garden and the views out need to be nicely framed and lead the eye, inviting you out to discover the garden. 2 Keep it simple: keep the material choices to a minimum, for instance one type of stone used in different finishes for inside and out, or for areas of the garden with different characters, and use repetition in the planting too to create a sense of harmony. 3 Create a private haven: introduce a secluded area that feels intimate and tranquil where a glass of wine can be sipped or it is possible to sit and relax. Introducing vertical elements such as a semi transparent screen, a wall or a tall hedge works wonderfully, creating an unexpected space that breaks down the emptiness of a garden and spurs us on to walk and discover what’s beyond. 4 Create spaces that look good in every season: May and June are the months of the year where a garden looks at its best, with lavender, geraniums, alchemilla, roses etc. all flowering their socks off. Yet these plants can also go over quickly and leave an empty gap for many months to come. Try and avoid planting that fades too quickly and choose instead a good backbone of evergreen shrubs that offer a long season of interest and perennials with pretty seedheads for structure in the winter. 5 Disguise the ugly bits: every garden has a view or wall that should not be viewed. Use plants and paths to lead the eye away, distracting you to look elsewhere. 6 Boundaries are key: use hedging to frame a sharp and clean lawn or a well-defined border. This will produce neat shapes that will help keep maintenance to a minimum and will make the garden look crisp and fresh. 7 Let the plants speak for themselves: don’t overcrowd them but give them space to breathe and to become established. Think about it in terms of layers of vertical interest and bring some taller perennials towards the front to break the mould and create a dynamic border and more interesting look. 8 Be bold: choose more of the same thing, so for instance put together two plants of the same colour (such as bronze fennel and black phormium) to create a good textural foil for the rest of the garden. A similar result can be achieved by repeating similar shapes at different levels (such as round pots, round lawns, allium heads etc.). 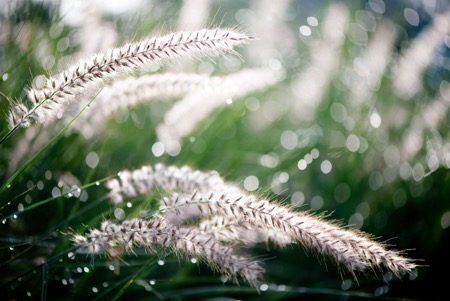 9 Don’t be afraid of grasses: grasses add a softness and a texture that is invaluable to any garden and they have very good longevity too, especially the ones with interesting seed heads. 10 Use splashes of colour to draw attention: but keep the overall picture harmonious by restricting the colour palette. The effect you are trying to achieve is pleasing and not a muddled mix! Emanuela Alladio of Alladio Sims Garden Design explains the importance of colour and its reaction to light in the design of any garden. I love colour. I find accents of strong bold colours uplifting and invigorating, and blocks of cool shades very restful and calming. Colours can set the tone of a story and unify a space, setting the mood of the entire garden – the hot spicy tones of reds and yellows grabbing our attention and lifting our spirits and the cool hues of blues and purples relaxing our minds. Yet nothing is as complex as colour, because colour is made out of light, and its variety of hues and tones changes in relation to the quality of the sunlight that hits it. Choosing the right colour scheme for a garden is one of the key elements to consider when designing it. But if ultimately colour is the plants’ response to light, then a successful garden design must understand how plants respond to light by ‘lighting them up’ and using them to their best effect. Growing up in Italy, I was blessed by month after month of relentlessly powerful sunlight and bottomless blue skies and I soon learnt to appreciate the colour enhancing properties of the sun, especially on warmer hues and vibrant combinations. Yet in the harsh light of a hot summer afternoon, these tones would sometimes become overbearing. This extreme light context contrasts with the soft colour combinations of a classic English border illuminated by the gentle diffused light of a misty or cloudy sky; here the subtlety of each hue is allowed to show itself – soft pinks and pastel tones glow, coppery hues are warm under grey skies, while whites gather what light there is and sparkle against the green foliage foil. This dynamic reaction to light shows just how the process of designing a successful garden must start by observing local colours and the way in which they behave in local natural light conditions in an attempt to recreate some of this magic within the garden. Colours look different in different climates and not all climates support the same tones, so better to be restrained in choosing and using them, like in so many classic Italian gardens or in the famous English ‘White Garden’ of Sissinghurst, where a limited mix of grey, green and white interacts creating sheer light magic based on the principle set out by its designer, Vita Sackville-West: “Any colour, as long as it’s white”. Attempting to design a garden closely obeying the criteria set out by a colour wheel has often proved disappointing. Of course, adding colourful accents can be fun and can help introduce brief moments of delight, but when this is not connected to the bigger picture, or it’s not bold enough to make a statement, it can appear too harsh and fail to work overall. Instead, I always start by observing how colours behave locally and how they help to form a certain mood or create drama in a specific setting. Once I have gathered this information, I try to replicate some of these aspects within the garden. By striving to understand the continuously evolving light properties of a specific garden, I can play with light and dark and the full spectrum of hues available within different times of the day, different seasons and throughout the evolution of a plant life cycle. The vivid light shining through a daffodil in the pale rosy morning glow takes on red tones in the evening, while the golden rich tones of the autumn sun make purple asters and the yellow of maturing grasses glow. With the passing of time light changes, and these changes allow plants to illuminate dark corners, bounce light from under tree canopies, shimmer against the evening sunset and look vibrant and alive when backlit. A silver leaf plant like Salvia argentea, whose woolly leaves shine even on the dullest of days, is capable of radiating light as soon as the sun hits it and therefore is best placed where the sun shines directly on it. A dark leaf such as that of an Asarum will absorb light to make the best of its shady growing condition, but in early morning light its glossy surface will be reflective. A golden or yellow leaved plant will work in much the same way as a white flower would, radiating light back from its leaves but adding a golden glow. Hackonechloa macra aureola is one such plant, forming a divine mat of luminous golden blades in the under storey of trees or other dry and inhospitable shady spots, which appears magic when the early morning or evening light goes through it. Ferns behave in a similar way too. When such simple and beautiful golden luminescence is available, the plant palette can be kept relatively simple. Difficult as it may be, designing a garden with these fleeting but wonderful colour and light effects in mind is to try and recreate beauty, and whilst it’s true that plants’ behaviour will somehow always be partially beyond our control, there is a sense of real accomplishment and satisfaction when such moments of joy are achieved. 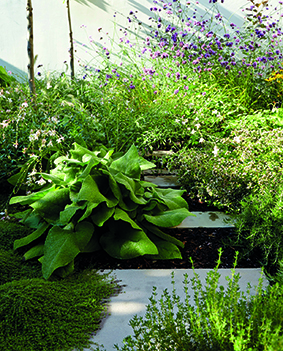 Emanuela Alladio of Alladio Sims Garden Design asks what makes a garden a unique space? Here she explains why location, the brief, the budget and a garden’s peculiar series of opportunities and constraints all play a very important part in the mix. Perhaps more than anything else one of the key aspects that can give a garden or a space its own unique identity is its edges and boundaries, and the way in which they define and constrain the space and flow within and the relationship with what’s around it. We often wonder how best to blur the edges between building and garden, and between ‘managed’ garden and ‘wilder’ landscape. And as garden designers we constantly make decisions that manipulate those same edges and redefine them – by blurring them or ‘greening’ them we try to make them disappear, hiding fences and walls; by using indigenous plants we disguise the edge between private garden and wilder location; by creating hybrid spaces we blur the boundaries between house and garden and introduce furniture and other objects that remind us of the indoor, but invite us to be outside. Some of the gardens we design can only be described through their boundaries and edges, starting with the drama of a window or a pergola leading the eye to the far end – an edge concealed and turned into an intriguing focal point. We like to introduce internal boundaries and edges too, by framing views and forcing us to take a break, by creating different ‘rooms’ with screens and embellishing them with plants, and simply by working with what’s already there, bringing new and old boundaries and edges together, mixing new solutions and restoring or blurring old ones. Boundaries and edges are there to challenge our senses and our behaviour, and when we design we like to consider ways in which we can do so in an unexpected manner, creating little surprises along the path, pushing us to stop and think and become emotionally involved with the space we find ourselves in. Front gardens and entrances provide the perfect setting to introduce strong and solid boundaries, but what happens when we challenge this idea and choose a more blurred, flowing and soft divide between house and front garden and street or greater landscape? Does that create an even more dramatic entrance? A few years ago, at a garden design conference in London, I remember looking at some images of a stunning American garden where instead of creating a clear cut division between road and house, the designer decided to blur the external boundary by ‘moving’ the surrounding forest very close to the front door, with some woodland elements making their way into the porch. By choosing hard materials for the front door, steps and landing, built using the local wood with natural finishes and colours that echoed the neighbouring landscape and by bringing the trees and middle shrubbery inside the house, the house became part of the forest, freed from its own boundaries, unified with nature and the surrounding spaces to establish the perfect flow. At the time everyone seemed fascinated by this concept and liked the idea of dissolving and blurring the edges. And I began to wonder wouldn’t it be useful if we considered boundaries as an essential part of the design brief and process and looked at ways in which we can utilise them to give a garden a more unique identity? Clearly, blurring the boundaries gives us the freedom to use plants more creatively. Once the harsh angles and edges have gone, plants are the perfect material to soften and conceal. And the best way to achieve surprising results is to throw in the mix different layers, shapes and textures – bold architectural silhouettes with dainty annuals against the sturdy foil of perennials dotted with some ordinary native plants to keep the flow going with the surrounding landscape. Indeed, combining plants with interesting forms and textures is the best way to mimic the intricacy of nature and to soften the transition between edges. Still, solid boundaries can be useful too, to entice movement and a sense of discovery of what’s beyond, and both planting, hedges and screens are useful tools to create strong layers that entice us to discover what’s just beyond or behind the hidden corner. Sometimes these junction points are there because of specific conditions that exist within and outside each garden, but often we introduce them and manipulate them to create the desired space. Indeed, as designers, it is our job to constantly make decisions that manipulate and redefine edges and boundaries and our role is to recognise them so that we can respond to them in a way that will make our gardens positively unique. 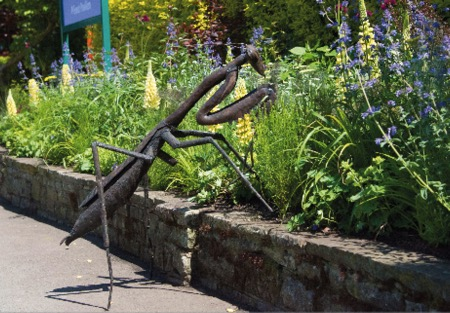 Emanuela Alladio of Alladio Sims Garden Design reminds readers to always plan ahead and anticipate any problems and risk when considering a gardening project. 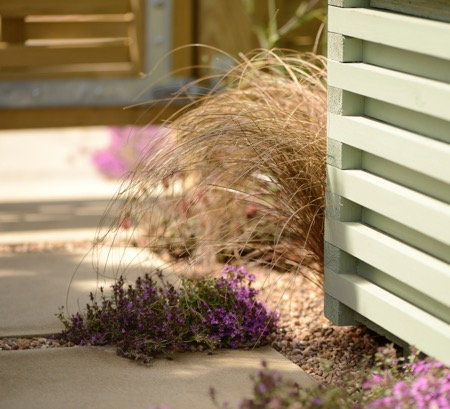 Our job at Alladio Sims as garden designers is to plan and look ahead, to think of as many variables as we can – from design brief to budget, from inspiration to practicalities and to be as open as we can with our clients and suppliers. In view of the above, for us, producing a programme and looking ahead is a necessity, no matter what size and type of project being considered. This principle applies to house and garden schemes alike, whether a project is small and straightforward, or large and complex. Anyone who has experienced a house renovation or any rebuild project knows all too well that they often bring a loss of privacy and a level of disruption that are deeply unwelcome for everyone. The distress they can cause is even more unpleasant when it lasts for longer than expected, and although no programme can ever eliminate the risk of a setback or two, it will prepare everyone involved for an easier journey. As designers, we understand that we need to be very open – it’s the only way to be. And so we are upfront and communicate from the word go any difficulties we might foresee: perhaps delays in preparing the site, working with unpredictable or poor weather, delays in planning applications, dealing with workloads and previous work commitments of chosen contractors and stock availability from nurseries. It is no coincidence that two of the busiest times for us in the office are winter and early spring, both good times to start thinking about the process of renovating a garden, when it is still not used for family relaxation and entertainment and when plants have the best chance of establishing themselves. A garden design project starting to take shape in autumn/early winter allows a client the best chance of seeing the project accomplished by springtime, ready for when the weather suddenly turns nice and spurs us to spend more time outdoors. Of course, no planning will ever take away all risks and unexpected surprises, but the increased awareness for all parties will help prepare for any disruption and create an easier ride for everyone during a garden project. A designer will always be open and willing to discuss the different elements to include in a comprehensive garden programme – timelines, budget and contingency sums, planning and permits, contractors and tenders, materials and plant supply, site constraints and bespoke elements’ build and supply times, poor weather, quality of contract etc. – these are just a few things to consider when getting started. If well managed through good communication and awareness, any unforeseen issues can be better resolved and a client can feel better engaged in the process and be more accommodating. Looking outside today, it’s certainly not too late yet: a little bit of forward planning will go a long way. Emanuela Alladio of Alladio Sims Garden Design reminds readers not to ignore the garden in winter, but to take the opportunity to fill in gaps and enjoy the subtle beauty of winter plants. Good gardens evolve with time and through the seasons, and they become much more open and transparent in winter, once leaves have fallen and been replaced by bare stems and empty gaps. At this time of year a garden really needs its backbone of shrubs and trees – from coloured stems and bark to the reassuring presence of evergreen ‘cushions’. But now is also a good time to take stock of what is there, to savour those often hidden sparkling treasures, and also to establish whether the gaps that have emerged are not too big, leaving the garden too bare and exposed in winter months. 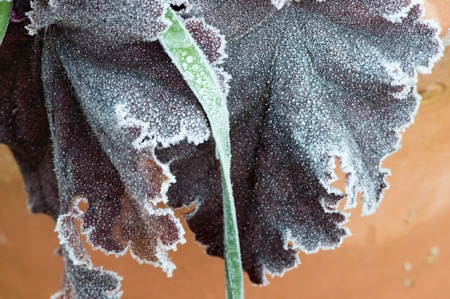 Amongst the surprises that the garden brings at this time of year are the minute frosty crystals sparkling on leaves and stems that shine gloriously on early frosty December mornings. Dissected and whole leaves catch the frost better than anything else, trapping sparkling crystals in the multitude of tiny nooks and crannies on their surface. Plants such as Alchemilla Mollis, Salvia Argentea or Melianthus Major will undoubtedly steal the show for a few magic days before finally dying down or becoming less prominent for the rest of winter. Winter gardens bring unexpected surprises for the other senses too, scent in particular being key among winter flowering plants and so well worth a place in any good garden design plan. One of the joys of visiting RHS Garden Wisley on an early winter morning has always been the walk up Battleston Hill and the sensation of suddenly being hit by the heady sweet perfume of a distant Daphne, tucked away in a sheltered and shady spot sometimes a good few metres away. Sarcococcas (Sweet Box) is another great shrub for this time of the year, with aromatic honeyed cream flowers creating a cloud of perfume each time someone passes. One would not want to be without them and so we always encourage clients to find a sheltered and shady space for at least one specimen, or better still, we position them by an entrance or a gate, perfect for that welcome back home. Another fond memory from RHS Garden Wisley is the Paper Bush – Edgeworthia Chrysantha – a truly spectacular sight in the midst of winter, this is a shrub covered in clusters of wholly white and yellow flowers, much like a string of Christmas lights, that light up even the darkest of days. An added bonus is its leaves too, very exotic and architectural once the flowers have disappeared. Adding to the list of sparkling beauties in the winter garden are Mahonias, despite the love-hate relationship they have always seemed to spark. But how could one resist their yellow plume of early December flowers followed by a cascade of long lasting damson-coloured berries? And if the spiky large specimen is simply too much, then why not settle for its new, smaller cousins, such as Mahonia ‘Soft Caress’, with pretty dissected leaves surprisingly thorn free. This is a wonderfully architectural plant with a strong presence that should be worthy of any garden. In the open gaps under the bare canopies of deciduous summer shrubs and among dormant leafy perennials now is the time to discover the little unsung heroes of the winter garden – candid Cyclamen Hederifolium flowers and the clear, pale blue flowers of Iris Unguicularis, reminiscent of a winter’s sky, the recumbent and discreet flowers of hellebores, the frothy leaves of evergreen ferns and heucheras, the heart shaped leaves of epimediums... so many small treasures! Without these winter garden beauties a garden would risk becoming too static, and not such an interesting space after all, incapable of evolving and changing its character throughout the seasons. The true mark of a successful garden should therefore also be its ability to stand out in winter, and to create an architecturally interesting space in the dormant season too. This is the perfect time to take stock of the garden, so go out and take a good look, make a note of any gaps that seem too big, but above all don’t forget to enjoy the subtle beauty of winter plants. Emanuela Alladio of Alladio Sims Garden Design explains why the seasonal colour shift of shrubs and trees is invaluable to gardens at this time of year. In recent years, shrubs and trees seem to have gone more and more out of fashion, leaving perennials to bask in the glory instead, with most of us seeking the fleeting and ephemeral pleasures of their short-lived flowers whilst following the latest garden trends. Yet it is precisely at this time of year that a garden, deprived of its backbone of shrubs and trees, will invariably disappoint by not being able to hold its own and provide the essential structure and colour changing boost needed during the drabbest of autumn and winter days. Some trees really excel at colour changing, establishing themselves as colour chameleon heroes, so it’s little wonder why we love this seasonal colour shift so much – we should think of the leaves as if they were flowers, morphing into different hues at different stages of their maturity. One of my favourite trees at this time of the year is the stag’s horn sumach, Rhus Typhina, with its multi-coloured fronds that look like a traffic light, from green to amber to red. Once the leaves are gone it has a good winter skeleton too. It does, of course, like to self-seed itself a bit, but it can easily be kept under control by pulling out any suckers as soon as they emerge. Acer Palmatums have, perhaps, the most attractive autumn colours of any genus. 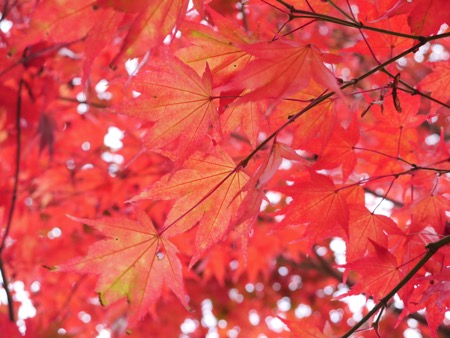 Often one species can display the whole range of autumn colours on the same tree, and one such wonder is undoubtedly Acer ‘Koto no ito’, whose leaves emerge green with a flush of crimson and then turn from buttery yellow to rich gold and end up in a warm amber tone before falling. The first time I came across a Cercidiphyllum japonicum was whilst walking in Winkworth Arboretum, near Godalming in Surrey. I was suddenly hit with the sweet and delicious scent of caramelised apple cake that pervaded the air in the lower woodland near the lake – the tree stopped me in my tracks and wowed with its golden coloured, heart-shaped leaves, tinged with copper and rosy tips: a real multisensory delight. Another great specimen providing a dazzling display at this time of year is the Persian ironwood, Parrotia Persica, whose scallop-shaped leaves take on a multitude of individual shades – from glowing oranges to intense reds and rich yellows. Even the humble silver birch cannot be forgotten for its striking contribution at this time of the year; the wonderful silhouette of its peeling tactile trunk – available in a multitude of hues, from the more widespread brilliant whites such as Betula utilis var. Jacquemontii ‘Grayswood Ghost’, to the soft gingery tones of Betula albosinensis ‘China Rose’ and the reddish brown tones of Betula albosinensis ‘Bhutan Sienna’ – adds year-round interest to the vivid rich yellow of its falling foliage. Euonymus, amongst the most invaluable shrubs to have in autumn for their fiery red hues, are one of my favourites for a country garden as they offer the added benefit of being wildlife-friendly – robins in particular especially love their brightly coloured berries. Of course, grasses are key at this time of year too, bringing soft buttery tones and slender stems that add movement and transparency to an overall scheme, catching the first drops of dew and adding a surprising long permanence to the winter garden. Pennisetums and Miscanthus are invaluable specimens to introduce autumn drama, dotted around the garden and repeated at regular intervals to guide the eye around the space, lacing together the whole composition in a pleasing way. If I could only make one concession for an invaluable perennial to have at this time of year it would have to be Amsonia hubrichtii, with its golden needle-like leaves that take on rich butter yellow tones. It is one such perennial that doesn’t get noticed at all until it’s ready to steal the show in autumn, providing early season good lower coverage to hide bare stems of roses or other shrubs with an unsightly base. It may take a while to find it, but it’s certainly worth the effort. Overall, autumn, being so subdued, can be a very demanding time of year for a garden, and it can only truly be mastered if the balance of shapes, foliage textures and colours is right. Shrubs and trees are invaluable elements in this composition and they can really transform a garden in autumn, and make this season sing with drama. 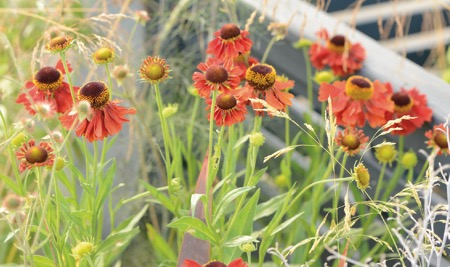 Emanuela Alladio of Alladio Sims Garden Landscape Design shares her top ten tips for creating a stunning garden worthy of an RHS show garden in our own homes. 1. Frame the view: most gardens are viewed from the house and in order to work they need to relate back to it. Key details of the architecture of the house need to be repeated within the garden and views out should be nicely framed and lead the eye, inviting exploration to discover the garden. 2. Keep it simple: material choices should be kept to a minimum. For instance, one type of stone used in different finishes for inside and out or for areas of the garden with different characters, and use repetition in the planting too to create a sense of harmony. 3. Create a private haven: introduce a secluded area that feels intimate and tranquil where a glass of wine can be sipped or where it is possible to sit and relax. Introducing vertical elements such as a semi transparent screen, a wall or a tall hedge works wonderfully, creating an unexpected space that breaks down the emptiness of a garden and spurs us on to walk and discover what’s beyond. 4. Create something that looks good in every season: June is the month of the year where every garden looks at its best, with lavender, geraniums, alchemilla, roses etc. all flowering and in prime condition. Yet these plants can fade quickly leaving an empty gap for many months to come. Try and avoid planting plants that fade so quickly and choose instead a good backbone of evergreen shrubs and perennials that offer a long season of interest and maybe even some pretty seed heads for the winter. 5. Disguise the ugly bits: every garden has a view or wall that shouldn’t be looked at. Use plants and paths to lead the eyes away, encouraging focus elsewhere. 6. Boundaries are key: use hedging to frame a sharp and clean lawn or a well-defined border. This will produce neat shapes that help keep maintenance to a minimum and make the garden look crisp and fresh. 7. Let the plants speak for themselves: don’t overcrowd, but give them space to breathe and become established. Think about it in terms of layers of vertical interest and bring some taller perennials towards the front to break the mould and create a dynamic border and more interesting look. 8. Be bold: choose more of the same thing, so for instance put together two plants of the same colour (such as bronze fennel and black phormium) to create a good textural foil for the rest of the garden. A similar result can be achieved by repeating similar shapes at different levels (such as round pots, round lawns, allium heads etc.). 9. Don’t be afraid of grasses: grasses add a softness and a texture that is invaluable to any garden and they have very good longevity too, especially the ones with interesting seed heads. 10. Use splashes of colour to draw attention: but keep the overall picture harmonious by restricting the colour palette. The effect to be achieved is pleasing and not a muddled mix! Chelsea - making the wild look pretty? 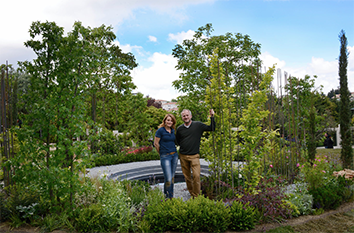 Emanuela Alladio of Alladio Sims Garden Landscape Design Limited describes her experience of creating four show feature installations at this year’s prestigious Chelsea Flower Show with her fellow director Jon Sims. Every year the Chelsea Flower Show is an unparalleled experience for everyone who loves gardens – an explosion of flowers and ideas assaulting the senses the minute you walk through the gate, bursting with colours, shapes and scents, some very brash and bold and boisterous and others more quiet, restrained and soft. The Chelsea Flower Show has something to offer for every taste. This year Alladio Sims was asked by the RHS to create four separate show feature installations around the show ground. 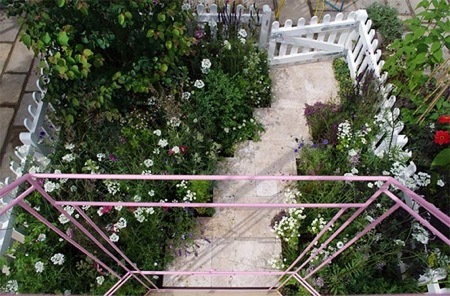 There had been a reduced number of show gardens this year, possibly a consequence of the Brexit vote, as each garden at Chelsea usually requires a high level of sponsorship to bring it to life. Despite this, the reduced numbers made for an undoubtedly more relaxed and leisurely show. Instead of rushing to see the next show garden, this year visitors seemed to slow down, taking their time to enjoy and digest what they saw and making the most of the opportunities to meet and engage with the designers. The rare opportunity to share the joys and tribulations of the process of creating a show feature at this prestigious event was one Jon and I grabbed with both hands. It’s a treat to display your ideas to so many enthusiastic visitors and to listen to their views on the gardens they see and is one that we as designers relish the most. It is a great chance for us to obtain a good indication of what people like or dislike, and it is so heart warming when our work is able to bring joy to so many people. 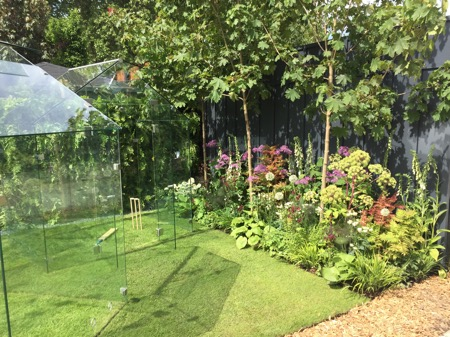 In creating evocative and atmospheric garden spaces we hope to stimulate reactions, feelings and memories that make a thoroughly engaging spectacle for the viewer. Indeed, we believe the level of visitor engagement is the true measure of a successful show garden. Venturing inside the Great Pavilion the passion for plants really transpires on the growers’ faces. If you engaged them in conversation they are always very willing to share growing tips and secrets, because they too are in tune with those who share their passion for plants. What was the real star of the show this year? We think there were two opposing camps: one really bold and almost garish (with bright pink rhododendrons, showy lupins and explosive oranges) and one much more restrained, naturalist and soft, closer to what a natural habitat would look like without any artificial intervention. Needless to say these two camps divided visitors, sparking criticism towards the more unkempt look and equally leaving others unimpressed by the very showy and contrived nature of the more manicured gardens. Who is correct? Should a show garden only contain perfect specimen plants and highly manicured borders, or should it portray a landscape close to the one where the plants would survive naturally? We think there is space for showcasing both options: the trick is to give visitors enough information that they can engage with it – if you share the passion, the personal experience that inspired it, and the long journey taken to create it people will, without fail, fall in love with even the commonest plants and the landscape they illustrate. A path in a garden is often an expression of how an owner wishes to use it: an expression of personality in the landscape. Emanuela Alladio of Alladio Sims Garden Landscape Design Limited asks: “Which one are you?”. A path can be a straight line, following the most direct route to reach a destination that might be a seat, a sculptural element or a view; it can be a meandering route, allowing time to linger to take in surroundings, or an unpredictable route that leads out and then allows the walker to find his or her own way on to lawns, into woods or round ponds. Alternatively, a path can follow a zig zag route that opens on to unpredicted elements or reveals the next surprise, be it a view or another unexpected space. Gardens are all shapes and sizes and path options are as diverse, but they are key to a great design that delivers the user into a garden in a way that individually suits. A couple of years ago, Alladio Sims created a show garden for the RHS Hampton Court Palace Flower Show. It was called ‘The Secret Garden Party’ and set out to illustrate a community of gardeners. It became a study, investigating just how differently the paths crossing six equal sized and shaped front gardens could express a personality. The result was an eclectic mix of styles, atmospheres and solutions that was greatly admired by the public. While the spaces were small, the results were scalable and clearly showed how a path gives structure to the personality of a garden. Our first garden welcomed a happy mix of softer and more formal elements – the rectangular stepping stones in a matte honed natural stone, chosen in two different sizes and spaced at regular intervals through the gravel connected the front door to the gate, while the surrounding gravel, in a complementing tone, let the path merge with the dry borders, softening and blurring the edges. Here the chosen line was straight, so quite formal, but with staggered ends showing the benefit of stepping stones that allow the movement to be more dynamic thanks to a mixture of stone sizes and offset joints. Stepping stone paths would work equally well across a lawn loosely or directly linking to spaces beyond. 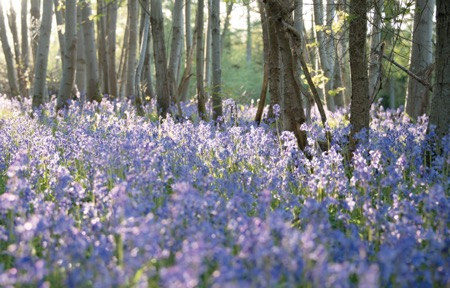 They are relatively easy to construct and look very naturalised once they are allowed to settle in. A wandering route is a great solution for those who prefer a more romantic or relaxed garden, and the materials chosen in our second garden show just how free its form can be: from a simple path mown out of long grass or a meadow, to a loose, windy gravel route through a dry garden, or a chipped bark path disappearing into a wood, naturalising to perfection as it ages. Wandering along such a path one is often surprised by sudden clearings, or peaceful sunny corners perfect for a bistro table and chair set: a haven for contemplation and relaxation. In line with this relaxed approach and perfect for a sunny courtyard, the next garden used bricks laid across a diagonal straight line, cutting through the space and blurring boundaries with surrounding gravel mulch borders. Laying bricks across the route makes the space appear bigger and slows one down, an invitation to take time and linger. This is quite an informal path that brings to mind the Mediterranean, and with it images of gardens in Italy or Greece where plants and hard materials mingle to soften te boundaries and delight the eye. The feel of our third garden was mainly determined by the way the path was laid. Using standard stone slab sizes to create a staggered path gives a clear route, but with a more naturalised edge. This is a good alternative to a traditional red brick path. The soft pastel shades of the planting and picket fence complement the natural hues of the chosen paving stones in this contemporary English cottage garden. Spilling on top of the path, the dreamy planting softens the staggered edges and draws one in to smell the blooms. Recycling can throw up some great solutions and in the next garden we reused clay roof tiles on edge. Rustic upcycled materials with gaps left for the plants to colonise created a strong textural element that fits in perfectly with the exuberant nature of the surrounding planting in this garden. There are other options for recycled materials including bricks, broken slabs and even wine bottles, used bases up, could work. They do lend themselves to a loose, winding path given the mismatched nature of the materials. This style would make the perfect choice in a classic country garden. Overall, the paths in our first four gardens offered a certain degree of flexibility in the implementation of their designs and are probably the kind of creations that would appeal to a more informal ‘artisan’ type garden. The last two gardens, however, were aimed at showing paths that took control – with crisp edges that create strong transitions between soft and hard landscape. 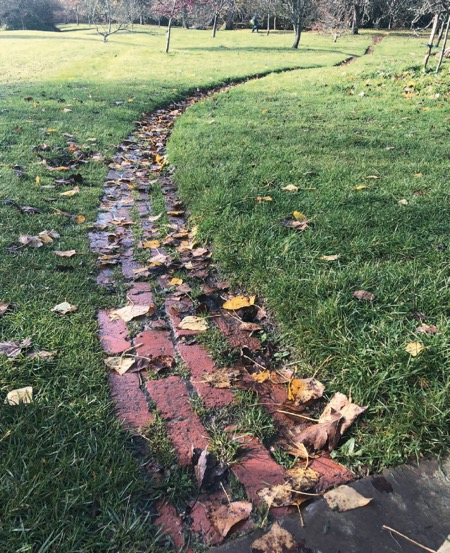 Garden five presented a curved path which showed just how the route may be soft in line, but unlike other wandering pathways, nothing here was left to chance: the slabs were perfectly cut, laid and grouted, and the finish is the same as would be expected on a kitchen floor. When selecting a curved path, material choice is key as most hard path materials are rectangular. Here we selected large slabs so that the edge kept the cut pieces larger and the angled direction broadened the sense of width. 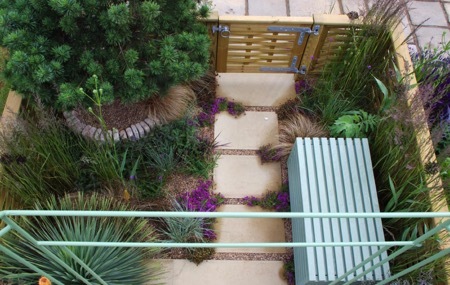 The last garden really illustrates a path that takes total control of the space around it. This straight and perfectly symmetrical path provides a very precise solution to a classic design. The planting falls in line to reflect the very high degree of precision and extends the mirroring effect to the left and right of it. Requiring a solid base and very neat edges, the paving slabs are consistent in size and tones complementary to the formal planting. 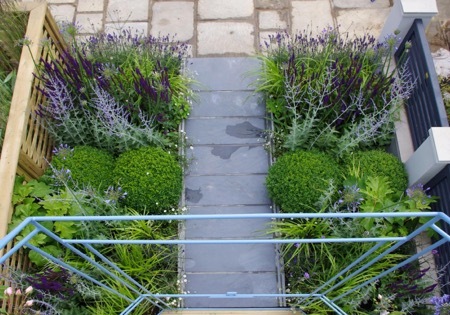 In larger gardens straight paths are used to lead the eye to a special view or feature at the end, and are perfect for creating long views in line with windows or doors. In short, each path tells an interesting story – be it a reflection of a more artistic, free spirited or exuberant soul, or that of a style conscious minimalist spirit – and finding it is just one of the many surprises it will bring. Next time you wander down a garden path, the backbone of any garden design, notice its very own unique story, or perhaps even just think, if I was a path, which path would I be? A broader approach to any design project can achieve a property’s full potential. Emanuela Alladio of Alladio Sims Garden Landscape Design Limited advocates planning outdoor spaces right from the beginning of any project. When planning a new extension or build, we tend to think inside the box. We visualise the house as the main box, sitting somewhat alone on a piece of landscape, and then divide this empty box into separate rooms, each with its own very specific function to fulfil – each a smaller, yet still empty, box (furnishings are often brought into action at a later stage). Once the main box is finished, we stop to wonder how the box relates to the space around it. Only at the end do we think of ways to soften the building and make it sit more naturally within the outside space. The result is that often the finished box doesn’t connect with the neighbourhood or the wider landscape, and the inside/outside flow is seriously compromised and its potential lost. Yet when we admire images of houses and gardens conceived with an integrated approach, we are in awe. So why consider the relation between house and landscape as an afterthought? Wouldn’t it be better if someone was in charge of thinking outside the box from the very beginning of a project? We could do so much more if we engaged the building with its surrounds from the very beginning. If, at the early planning stage, client, architects, garden designer and interior designer all sat at the same table the result would mean much fewer lost opportunities, well-integrated solutions and useful economies of scale. We hire architects to create forms from interconnected spaces, focusing on concepts such as flow and aesthetic, we hire interior designers to introduce the right mood and texture to each and every one of these spaces. 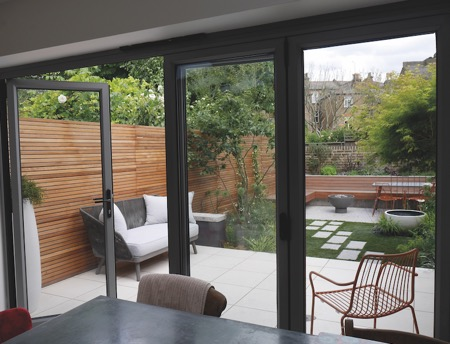 All our energy is spent worrying about what happens inside – floors, furniture, curtains, light fittings, kitchens and bathrooms – forgetting that this beautiful flow will stop as soon as those brand new bi-fold doors open – and we are faced with an empty and alien back garden. Yet the solution is out there. Bringing in a skilled garden designer can continue the dialogue outside. A skilled designer will absorb information from all sources and develop the outside space to extend the link with the house. Your brilliant, new, glass-clad, sleek kitchen living area will no longer open to an uninspiring and empty back garden. You will discover a new world of potential and create a stunning outdoor room. Some tricks are simple: choose the same porcelain tiles installed in the kitchen for the patio area – in a different finish to add slip resistance outside – to achieve that instant, seamless, indoor/outdoor transition. Make the most of the expanse of glass walls in your new extension by controlling the views out, creating new ones, adding light and water for a touch of drama. Of course, just like a good architect or interior designer, a great garden designer will guide you through this process, looking at the ‘outside box’ and dividing it up into a series of meaningful layers each with a different function: privacy, drama, entertaining, framing the view etc. And the difference will be in the small details – identifying the best aspect for dining or enjoying a swim or a view, making the space feel much bigger and more inviting thanks to directional paving or the right materials and plant palettes, choosing the best plants for the site given the local soil, drainage and exposure to the elements. Once this process is complete, the indoor/outdoor flow will be seamless. Despite this enormous potential, so often garden designers are called to ‘intervene’ right at the end of the renovation, new build or extension, missing out on some earlier opportunities. Considering the outer environment can bring so many tangible advantages to any development, for example, by making the most of an existing level, framing a borrowed view from the landscape and creating a positive link between the building and its surrounds. This can be easily achieved if the garden designer is engaged from the beginning as a three-way conversation with the architect and client. It would often mean saving on costs too as later ‘interventions’ are minimised. This holistic approach to an extension or a new build is already very established across the ocean and is being adopted here too, producing some amazing results. Next time we admire a stunning new build if we ask ourselves why our eyes are so drawn by what they see it will no doubt be the very unique connection that the building has managed to establish with its surrounds, the creative use of local materials, the effective and functional use of space, the clever yet understated details. This very elegant product will be the result of clever thinking outside the box.